A treatment activist chronicles the unique health and psychosocial challenges of long-term survivors and outlines goals for mobilization. The following is an excerpt from a white paper, which was released on December 1, 2016. In 2013, three long-term survivors from San Francisco, all former ACT UP Golden Gate activists, were growing concerned about disturbing mental health trends in the community. Many of their friends, most of whom were also long-term survivors, seemed to be in a major funk—some for years. Depression had become all too common and so many people seemed isolated and lost, even in the vibrant city of San Francisco. There were other issues that arose as well, such as economic stress in one of the most expensive cities in the country. Many survivors were on strict disability plans and had no options but to stay where they were, and rents were skyrocketing. There was confusion and some community apathy about what to do, how to plan for any future that was left, how to reengage with the community, and how to become alive again. These survivors were despondent and became worried about their future. As we recognized from our past history of activism, there was a need for an awakening; a kind of survivor community mobilization. It was time to gather together to listen and learn as much as possible, and work together to meet these new challenges posed by HIV/AIDS. Soon, a clearer idea of possible solutions would develop from a collective survivor response. At about that time, the news of Spencer Cox’s death came. And there were survivor suicides right in our own community. 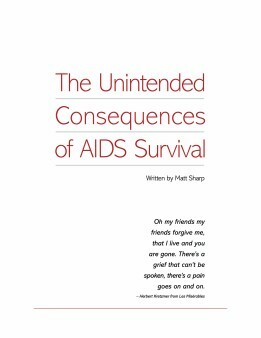 Lack of support for aging and survivorship issues from the AIDS service organizations we had relied on for so long was virtually nonexistent. There were no specific programs for long-term survivors in most city organizations or almost anywhere in the country, for that matter. It became clear that survivorship, and the unintended consequences associated with it, were not seriously considered in a community that clearly had other priorities. In order to slow this destructive trend, survivors had to take charge and take matters into their own hands, as had always happened in this community. A steering committee of about eight long-term survivors volunteered to organize and strategize each week in a small space at Castro and 18th, just one block but light-years away from the ACT UP Golden Gate meeting space. The meetings were incredibly emotional as each person told their survivor stories. The process of returning to community mobilization after so many years of little activity was di cult for the committee. In no time, though, an incredible reunion of survivors in the San Francisco community took shape, and issues poured forth as people told their stories, their voices were heard, and action was taken to begin addressing the future. The first town hall forum for HIV/AIDS survivors was held in September 2013. More than 175 people came together in a packed room at the LGBT Center. Clearly, a nerve had been struck, and people wanted to speak out and wanted to be heard. Survivors reunited that night for a kind of cathartic experience, and left with vigor, renewed energy, and hope. Valuable information was collected from survivors about a myriad of issues, how lives had changed, and what needed to change in the city. In only a few months, after several town hall meetings and lots of press, there was a clear sense of long-term survivor mobilization and activity in San Francisco. It was evident that one identified issue—isolation—was being addressed just by taking these first steps and coming together. Survivor mobilization, advocacy, and energy has led to improvement in HIV aging focus in the San Francisco city government. A San Francisco Department of Aging & Adult Services subcommittee for seniors known as the Long-term Care Coordinating Committee has formed an active HIV and Aging policy workgroup. The workgroup has been tireless in coordinating a citywide HIV and aging needs assessment and policy recommendations report. A budget recommendation has also been approved by the city. New social meeting groups have become very successful and are a model for engaging HIV/AIDS long-term survivors. The Elizabeth Taylor 50-Plus Network for Gay, Bisexual, and Trans Men at the San Francisco AIDS Foundation uses social media to keep hundreds of members engaged in social activities several times a week. Regular group emails keep members aware of a wide variety of social gatherings, volunteer opportunities, free entertainment options, and more. Honoring Our Experience is a weekend, out-of-town retreat for all people affected by HIV. Experiential in nature, the facilitated retreat fosters engagement of the whole person: mind, body, and spirit. Participants share stories, music, reflection, walks in nature, writing, laughter, and tears. Joining together as one community in this retreat enables a unique healing experience through inspiration from each person’s courage and resilience. “HIV Long-term Survivors” is a closed Facebook group with thousands of members internationally, which is generating a lot of buzz and mobilizing HIV/AIDS long- term survivors all over the world. Housing is a huge burden on older people with HIV, especially in San Francisco. Openhouse focuses on LGBT senior services and referrals and is a terrific resource for HIV seniors. Building on the success in San Francisco, national projects designed to reach survivors across the country are underway. The Reunion Project, offered with support from Bristol-Myers Squibb and Test Positive Aware Network in Chicago, is a town hall “reunion” for survivors staged in selected host cities. A “reunion” is often the first time a group of survivors has met together to tell their stories of survival, feels part of a community, end isolation, and begin to hope. To set up a reunion, national organizers work with volunteers in the host cities to plan the summit program agenda and strategy tailored to the survivors in their city. Since starting the project in 2015, The Reunion Project Town Hall events have been held in Chicago; Palm Springs, CA; and Philadelphia. Increasing diversity is a primary goal for the future, and The Reunion Project is currently diversifying leadership and planning summits in South Florida and Atlanta. New funding will bring the summits to more cities in 2017. The National Minority AIDS Council (NMAC), a major national AIDS organization, has begun a national service provider training program called HIV 50+ Strong and Healthy. The first training took place at the United States Conference on AIDS (USCA) in September 2016. It is slated to continue. Mechanisms of the unintended psychosocial consequences of survival are complex and unique, and developing interventions and research are only beginning to shed light. As usual, there remain many more questions than answers. Noted researchers such as Rick Loftus, MD; Ron Stall, PhD, MPH; Adam Carrico, PhD; Michael Plankey, MD; and David Fawcett, PhD have brought to light a variety of behavioral factors mostly with HIV-positive gay men, and no doubt, their continued interest in the field may garner hope. In New York City, the AIDS Community Research Initiative of America (ACRIA) is recognized as a leader and one of the first groups to dedicate research provider trainings and programming for older adults in HIV. In 2006, a comprehensive study of 1000 older adults living in New York City was published: Research on Older Adults with HIV (ROAH) is the first study of its kind and focuses on psychosocial, societal, and mental health components in older HIV-positive people. A second extended, larger, and more comprehensive phase of the study “ROAH 2” will be starting in San Francisco, Atlanta, Chicago, Los Angeles, New Orleans/Baton Rouge, San Juan, Houston, Miami/Ft Lauderdale, and Washington DC The longitudinal data collected through detailed surveys and focus groups in ROAH 2 will help build a comprehensive understanding of many of the issues older people with HIV face every day. The Coachella Valley Community Research Initiative has leveraged Palm Springs’ unique concentration of older people living with HIV to start Project GRACIE (Geriatric Research of AIDS Comorbidities in the Inland Empire). The purpose of this project is to combine the e orts of loyal HIV providers to assemble a cohort of those aging with HIV—especially those older than 60—on whom very little data exist. As traditional longitudinal cohorts such as the Multicenter AIDS Cohort Study (MACS) and the HIV Outpatient Study (HOPS) see funding cut or eliminated, Project GRACIE will allow researchers to compare participants with their age-matched peers in order to assess the effects of HIV on aging. Simultaneously, researchers will be able to study interventions for aging conditions such as body shape changes and neurocognitive problems. New, fascinating protocols and methodologies into behavioral and psychosocial interventions for older people are being planned. Many use newer methodologies that have seen success in other trauma-related diseases such as cancer and cancer recovery. These include eye movement desensitization and reprocessing (EMDR) and psilocybin-assisted group therapy. It is encouraging to see this level of interventional research being planned, especially since older antidepressants, counseling, and other dated interventions may not be sufficient to address the complicated and demoralizing trauma experienced by long-term survivors. Awareness of HIV/AIDS long-term survivorship is a dynamic process. New and existing research, workshops, trainings, committees, town hall forums, retreats, social media, and even two major acclaimed lm documentaries, Last Men Standing and Desert Migration, are collectively a force that will hopefully bring an end to survivor suffering. Matt Sharp, who was diagnosed with HIV in 1988, is a long-term survivor of HIV and celebrated his 60th birthday this year (2016). Co-founder of the Reunion Project, he is thriving as a community organizer, AIDS treatment activist, writer and teacher. He lives in Berkeley, California with his dog Bettie.